Although we don’t like to think about it, the reality is that if we live long enough, all of us will need help at some point. That doesn’t mean we are doing something wrong, it’s just a fact. If we aren’t felled by a heart attack or some other sudden, catastrophic illness or accident, we will have cognitive or physical issues—including vision, mobility or hearing declines--that require assistance. At Daystar Retirement Village we have residents who choose to move into an assisted living apartment long before they have need for any assistance at all. Some of them simply like the convenience of not having to worry about meal preparation, housekeeping or laundry. Others make the move to assisted living only when they are already having trouble with one or more activities of daily living, such as managing their medication or preparing meals. Figuring out next steps when a parent needs assistance is never easy, but certainly planning ahead helps. Talking with your loved one before there is an immediate concern allows you to make plans thoughtfully, rather than feeling desperate to do something. These eight warning signs from the Web site caregivers.com signs will help you determine if your loved one is still fully capable of independent living, or if perhaps it’s time to start thinking about a transition to at least a minimal level of assistance. Letting things go around the house. For example, lots of clutter, piles of laundry, spoiled food, dying plants, dirty dishes that appear to have been sitting for a long time or overflowing trash. Neglecting personal care. This can range from not shaving or bathing regularly to wearing dirty clothes. Changes in personality. Slowing down a bit one thing, but being depressed or withdrawn is another. Pay attention to whether your loved one is still socializing with friends and enjoying hobbies or activities that were once enjoyable. Safety issues. This is a big one. Can your loved one still manage medications and doctor appointments? Are there any mobility issues? Are falls a concern? Changes in eating habits. Does it appear they are eating three meals a day? Is the refrigerator clean and stocked with healthy food, or is it empty or filled with expired or spoiled food? Is there a noticeable change in weight? Losing weight could mean they are having trouble preparing appetizing food, but gaining weight could mean they are filling up on sweets and aren’t getting the nutritious foods they need. Overall cognitive decline. Behaviors that can be masked during a short phone conversation might be more apparent in person. For example, repeating stories, confusion following directions, trouble following a conversation, memory lapses about recent events. Driving issues. Obviously an increase in traffic tickets is a problem, but look too for driving under (or over) the speed limit, tailgating, getting lost in familiar areas, increased dents or scrapes on the car. For many adult children living far from aging parents, the holidays can be an unwelcome reality check. Weekly or even daily telephone calls can keep you connected, but subtle, yet significant, changes can be hard to detect in a 10 minute conversation. If you loved one is experiencing any of these warning signs, now is a good time to start thinking about next steps. 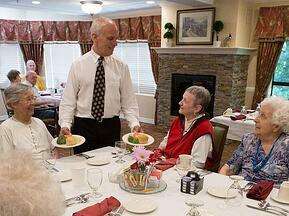 If you’d like to see what we have to offer at Daystar Retirement Village, please contact us today for a personal tour.